I am using 4 hourly chart to decide on my trading. I am not really comfortable with this trade, as there is high chance that stock markets worldwide will try to maintain at high close for middle year window dressing at least for today. I have to be very cautious on this trade. I closed the position as everything seems positive. There is no reason for me to risk further. I don't care what the direction the price is heading to. It might goes down. Closing the current position and wait is the only way for now. 1) CPO Price went higher than yesterday high (2340) but failed to stay at the high; The market could be weak. 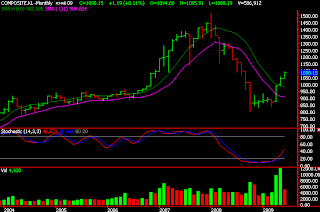 2) Based on 4 hourly chart, the stochastic was at overbought area and started to break down. 3) There is no good reason to risk over weekend. I always believe in candle stick chart than bar chart as candle stick chart has clearer picture of the price action than bar chart. Looking the two charts below (KLSE Monthly Chart); one candlestick chart and the other one bar chart, the appearance is obvious. For more information on the candlestick chart, I found a site that are very informative. I am going for a short term trade meaning that I will cash out when I had profit. I am not hoping for a big profit for this trade. I locked the profit as I had making small profit in mind at the time of entering the trade.